Want your marketing materials inserted and mailed? titheenvelope offers mailing envelopes where you can have your logo and branding printed. We offer different sizes depending on what kind of material you plan to insert. #10 Window and Non-window Envelope – Here you can insert letterheads, brochures, flyers, gift certificates, event tickets, and more. This is a regular-sized letter envelope where you can have your brand printed. “A” sized envelopes – These are business correspondence envelopes which sizes are mainly A2 (4.375” x 5.75”), A6 (4.75” x 6.5”), A7 (5.25” x 7.25”), and A9 (5.75” x 8.75”). 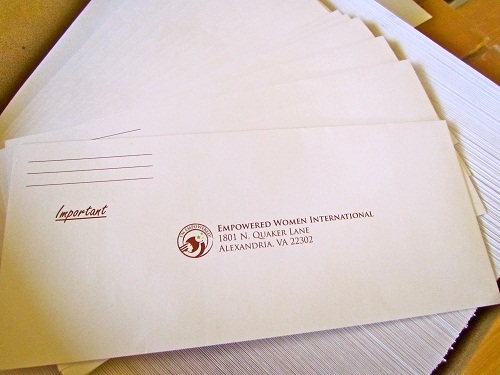 You can use these envelopes for business cards, postcards, event tickets, invitations, or even for multiple inserts. 6” x 9”– This envelope size accommodates invitation cards, postcards, greeting cards, event tickets, and other marketing collateral that fit. It has a square flap and the opening is located on the side. 9.5” x 12.5” Catalog Envelope – This envelope size accommodates catalogs and booklets. You can use these envelopes to mail your product catalogs to your clients. You can also add other inserts or use the envelope as a press kit container. On top of printing your logo and branding on your envelopes we can also do variable envelope printing for addressing if you hire our mailing service. For more information on our mailing services and mailing envelope printing, call us at 1-800-377-6155.